In our ongoing quest to conquer the Omnivore 100 list, we come to #28, Oysters. It’s hardly a chore for me to kick back several dozen oysters. My love affair with the bivalves began as a child watching my grandfather stir up some homemade oyster stew, mesmerized by the delicate edges curling up in the cream. At some point as a teenager I dared my first raw bar, and the salty brine was instantly addicting. I’ve never strayed, even after a disastrous food poisoning incident in New Orleans (on my birthday, no less). 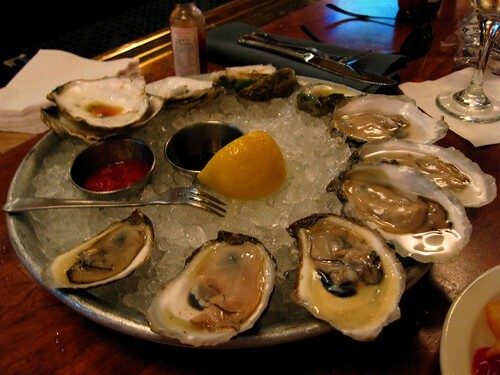 No, there really is nothing like the luscious oyster, and we’re lucky in DC to have plenty of places to enjoy them. Crowded with seafood lovers, this small restaurant manages to maintain quality and cheer amidst the noise. The oyster selection is ever-changing – check out the blackboard – and always pristine. Tops for slurping under the stars on the outside patio in the summer, and those averse to the raw oyster can enjoy them crispy in a po’boy. You do not have the break the bank in the main dining room at The Oceanaire, just park yourself at the swank oyster bar and indulge. With a nightly selection that I think may have the most variety in the city, it’s a good place to do the “three dozen ritual” – first dozen, order two of everything, second dozen, narrow it down to two favorites, third dozen, just the one you like best. Stagger out seeing merpeople. Three words: Oyster Happy Hour. Most of the Clyde’s restaurant group locations do an oyster happy hour, which these days is the best way to handle your addiction without breaking your savings account. With three bars at the Gallery Place location you can be assured of getting a spot – my favorite day is Sunday, but the happy hour runs Sunday through Thursday from 3pm-6pm and then again from 11pm-1am. And finally, a word to the wise – the venerable Oyster Riot at the Old Ebbitt is in its thirteenth year. If you like watching your oysters being shucked by experienced hands, this is the event for you, with a mind-boggling variety and crazy people-watching to boot. Getting tickets is a near impossibility (it sells out within minutes) but worth a try every year – my last successful attempt was three years ago and a blast. Great writeup, Jenn, although oysters are a taste that I will never acquire. I love Hank’s though. Their fish is always amazing (as is their mac ‘n cheese).